The winner of the 2014 Orlando MyShadi Bridal Expo Henna Competition is Salma Islam, mehndi artist and owner of Henna Allure. She moved to the United States with her family as a young child and has lived in Florida since she was six years old. A graduate of the University of Central Florida in accounting, Islam recently found her true calling as a mehndi artist. Learn more about what inspired her winning design. For those who are not familiar with you or your work, tell us about you started your business? I started doing henna as a hobby for friends and family. It was only two years ago that I decided to turn the thing I love into a business. I felt that if I was going to start my own business, then I needed to start it the right way. I made the decision to take the Ash Kumar henna course to improve my skills. 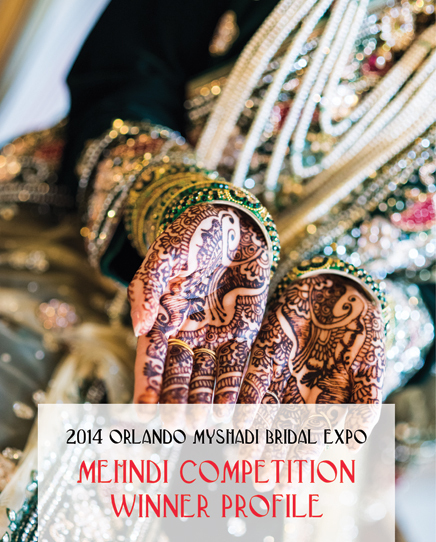 How does it feel to be the winner of the 2014 Orlando MyShadi Bridal Expo Mehndi Competition? In all honesty, I was surprised. I saw such intricate and beautiful designs that my fellow henna artists had done. But I felt confident in the design that I had done and simply wished for all the best! In the end, I was overwhelmed with joy! I was really proud of myself and felt so honored. Did you have a mehndi design in mind when you arrived on the day of the Expo? What was your inspiration being the winning design? Not really. I actually took inspiration from my model’s outfit. She wore a gorgeous salwar kameez, and I decided that the henna design should suit it as well. The rest was free handed to suit the overall design and the model’s hand. Your passion for this art form is evident. What inspired you to become a professional mehndi artist? Mehndi itself in as inspiration. I love how it makes people feel. The beauty behind this unique art form makes a girl feel like a princess. I remember having to do mehndi for a client of mine for thirteen hours straight and still being able to admire the allure of the henna. In fact, that’s why I named by company Henna Allure (beauty of henna). The biggest lesson I learned is that there is always room for improvement. Practice is the key! My favorite wedding so far has been my best friend’s wedding. 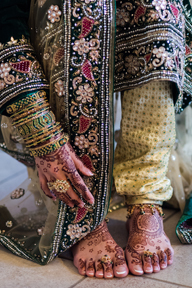 The reason why this was my favorite wedding is because ever since I had first started doing Mehndi, she always told me, “There is no one else that can do this better than you.” She is the one that encouraged me to make this little hobby of mine into a business. Along with full mehndi services, I also offer full bridal makeup and dupatta setting. I offer my services all over the state of Florida and am absolutely willing to do destination weddings! The best advice I can give to brides is to shop for quality of work, not just price. Always have a consultation and trials, even for henna. In the end, it is your wedding!